When God feels silent, it can be hard. Being confident of direction has been a struggle of mine since my college years. When trying to make decisions, I can feel panicked. My stomach gets upset, my mouth becomes dry and my brain fills with a rolling fog. There are moments in decision making, I truly feel like I can’t think. I experience total decision paralysis. This is something I’ve been actively working on for two decades and I’ve made huge progress. 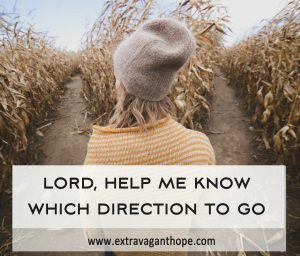 I can still get tripped up on a decision, but I’ve changed my way of thinking in some areas and have found tangible tools to help me hear God’s voice. 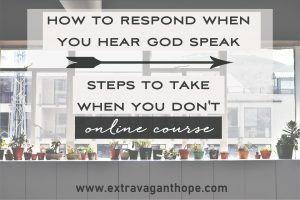 Extravagant Hope created a course called: What to do When You Hear God’s Voice; Steps to Take When You Don’t. 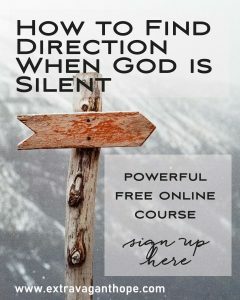 I teach the second part of the course: Finding Direction When God is Silent. 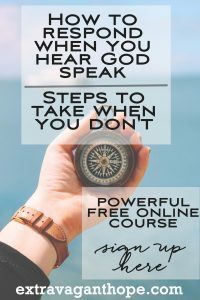 I don’t need to read what you cover – I struggle with decisions too, I want access to this FREE eCOURSE (video series)right now! Understanding God’s perfect plan versus free will was, and is, maddening. How exactly do free-will in humanity and an all-knowing, in-control God synch? We talk about this more in the FREE e-course video series. 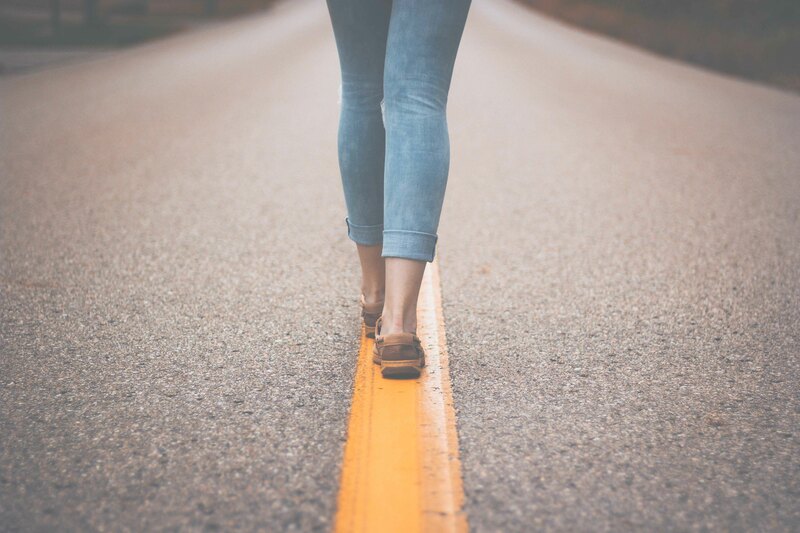 Next, I walk you through an activity that will help you examine your decision from various important angles and move forward with confidence. This Decision-Making Flower Diagram activity is based on the work of Richard Bolles, a leading authority in career counseling. (I learned about his work in a course I took for my Global Career Development Facilitator certificate.) I adapted Bolles’ flower diagram activity for everyday life decision making. (This flower-diagram is adapted from his book: What Color is your Parachute? A Practical Manuel for Job Hunters and Career Changers.) We’ll make a visual based on important aspects of our lives to better see our next right step. We’ll consider our life mission statement, gifts/talents/passions, life values, faith values, and more that, put together, will give us clarity. I expand more on these ideas in the FREE e-course video series. Two mental blocks are famous for holding us back. They can rob us of our confidence when it comes to making decisions: (1) Fear (2) Wanting to be 100% sure before we move forward. I have a lot to say on these topics, and I can’t wait to share my thoughts with you in the FREE e-course video series. I’m passionate about finding how you open your heart to hear God’s leading. Every woman needs some way in which she connects with her Creator. I have lots of ideas of how to find your place in communion with God and one more activity idea that will help you finalize your decision. Learn more in the FREE e-course video series. Don’t we wish that once we made our decision that we’d felt peace always-and-forever-the-end? Don’t we wish we’d never doubt a decision we carefully pondered and made? Y’all. It’s common to doubt. It’s okay to doubt, it means you are intentional with your life and that is a good thing. However, the doubt drives me crazy – but I’ve found one simple strategy that helps…learn more about it in the FREE e-course video series. 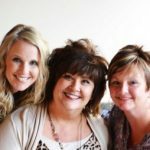 God doesn’t want us to feel panic, stomach pains, and brain fog when it comes to making decisions. He wants us to trust Him and move forward in confidence. I believe that we can all get there. How do I know? 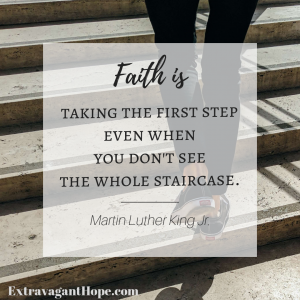 Because if God can move me past my decision paralysis – and I was like moving a mac truck with flat tires using only a skateboard – then God can move you too. I promise. Through subtle but consistent shifts in our thinking and actions, you’ll get where you want to be. I know you have this in you. Why? Because you made the decision to read to the end of this post. You’re one step closer to getting to a healthy place in decision making and/or healing from decision paralysis. Now, let me give you access to the free e-course (video series) and let’s hit this baby home. I think you will find the decision-making section of the course super helpful! We love you too!